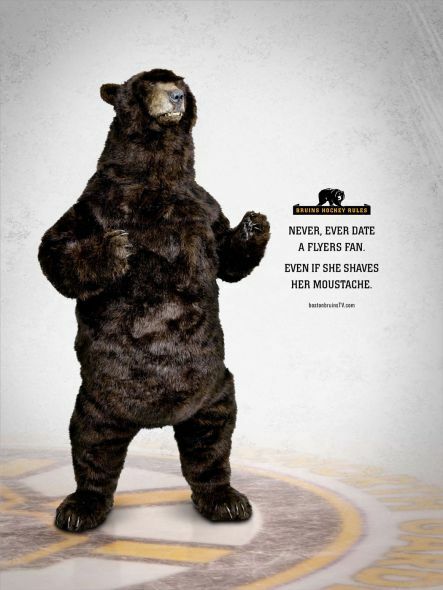 This was a real ad from the Bruins last season. After dispatching their hated rival in seven games by the slimmest of margins, the playoff storyline only grows with a rematch between the Flyers and Bruins. The two teams met last year in what is now a historic series in which the Flyers climbed out of a 3-0 series deficit and a 3-0 Game 7 hole to shock the Bruins and kick them out of the playoffs in embarrassing fashion. The two teams are different but largely the same. The Bruins are deep but lack any consistent scorer, are defensive-minded and have good goaltending. The Flyers have guys who can score up front, a tough team down the roster, and unknowns in goal. The two teams make for a physical series and are an interesting matchup stylistically. The Bruins are coming off of a seven game first round series, as are the Flyers. In contrast to last year the Flyers are the banged up team while the Bruins are largely healthy. The Bruins took the season series, going 3-0-1 but frequently got the Flyers at good times. Like always, don’t take much stock into regular season numbers.